How do you feel about Christian or tell us your own animal or pet story. 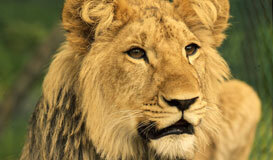 Christian the lion was born on 12 August 1969 in the Ilfracombe Zoo in Devon, UK. His mother Mary rejected the cubs who were then hand reared by staff. A few months later he and his sister were sold to the prestigious Harrods department store in London, probably to be used for publicity for the Christmas shoppers. 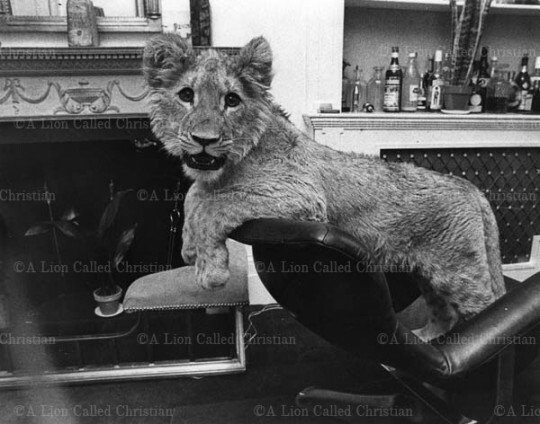 Ace Bourke and John Rendall were two young travellers from Australia who had just arrived in London in 1969, and on their first visit to Harrods saw and very unexpectedly bought a lion cub. They named him Christian as an ironic comment on Christians being fed to the lions historically, and to challenge stereotypes. They lived with Christian in London on the Kings Road in Chelsea, and Christian fitted in very well to London at that time when owning an exotic animal was not unheard of and before the Endangered Species Act of 1976. Ace and John realised that while Christian was an exceptionally good natured, gregarious and companionable animal, they had to create a stable environment for him. There was no manual for looking after lions and Ace and John had to trust their instincts and the experience of living with family pets all their lives. Christian lived in the large basement below Sophistocat; the antique pine furniture shop where Ace and John worked. Ace and John lived in the apartment above the shop. Every afternoon Ace and John took Christian to a nearby enclosed garden for exercise and recreation. In 1969 and 1970 London photographer Derek Cattani took many superb photographs of Christian at home, in the shop and in a garden. Derek also photographed Christian in several sessions on different occasions at various locations over London. These were for fun and while Christian enjoyed an occasional outing and adventure, these particular photographs do not reflect Christian’s day to day life. It was a quite stable (if unusual!) life and environment on the Kings Road, Chelsea, and the nearby garden where he played every afternoon. This was the secret to the success and enjoyment of Christian’s incident-free life in London. Christian grew very quickly and within months he was beginning to outgrow his environment (and frighten the customers). Ace and John were becoming increasingly concerned about the scarcity of options for his future, when by chance Bill Travers and Virginia McKenna came into Sophistocat shopping for some pine furniture. They had starred as George and Joy Adamson in the film Born Free in 1964 about the Adamson’s returning the lioness Elsa to the wild. Like the book, the film had been a huge international success. Like most people, they found Christian charismatic and “beautiful”. They suggested contacting George Adamson who could rehabilitate Christian back into a natural life in Kenya. This was an alternative Ace and John had not even dared dream of. With Christian now approaching his first birthday, and growing stronger every day, Christian, Ace and John left London and stayed with the Travers’ in the country with Christian living in a purpose-built compound in their garden. George Adamson, who was very interested in Christian as a fifth generation European lion, would build a man-made pride around Christian for their rehabilitation back into the wild. Negotiations with the Kenyan government for a suitable area of land dragged on for several months. A site called Kora in north-east Kenya was finally chosen, based on factors which included remoteness from local villagers, tourists and hunters. Two one-hour documentaries The Lion at World’s End and Christian the Lion were made about Christian’s return to Africa in 1970, and George Adamson assembling a pride of lions around him at Kora in Kenya, preparing him to take his chance at a natural life in the wild. Upon his arrival in Kenya Christian’s first challenge was meeting Boy, a large adult male lion who had been used in the filming of Born Free, and after injury, was being returned to the wild again. Other challenges were the hostile environment and the wild lions living there, and while they appreciated the introduced lionesses, the wild lions were unrelenting in their intention to drive any males like Boy and Christian from their territory. George Adamson realised immediately that Christian’s natural instincts were intact, but he was young and inexperienced, and that first year was anything but uneventful. Derek Cattani also photographed Christian’s return to Kenya, and other photographers documented Christian and George Adamson’s expanding pride of lions over the next few years. Consequently there is a marvellous record of this charismatic and photogenic lion whose incredible life story is still fascinating people over 40 years later. The documentaries were produced by Bill Travers and Morningstar Productions, and the director was James Hill whose credits included the well known television series The Avengers. These documentaries helped to finance Christian’s return to Africa, and the establishment of a camp for George Adamson and the lions for rehabilitation at Kora in Kenya. These documentaries are now available under the title of Christian the Lion, and are available from the Born Free Foundation. George loved Christian’s gregarious personality as well, and described him as “mischievous”, “cheerful” and “courageous”. A year later in 1971 Ace and John returned to see Christian, and their unforgettable reunion with a now much bigger lion has, forty years later, been viewed on YouTube and shows including the Oprah Winfrey show, The View and Ellen by well over 100 million people. This has introduced Christian to a new world audience who are intrigued and enchanted by his extraordinary story and are inspired to think more deeply about environmental and wildlife issues and animal welfare. 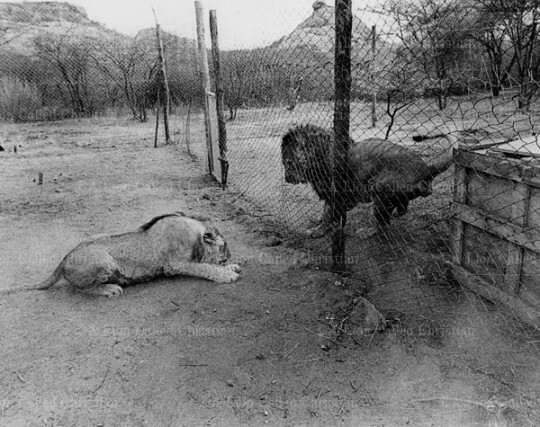 Although Christian had been heard mating by George Adamson, with the continued hostility from the local wild lions, Christian had been leaving George’s camp at Kora for longer and longer periods. He was last seen in early 1973, heading in the direction of the more bountiful Meru National Park. As he had survived the most dangerous early years and had grown very big and was intelligent and brave, Ace and John presume Christian had his own pride of lions and lived possibly another seven or eight years. His progeny are probably living there today. 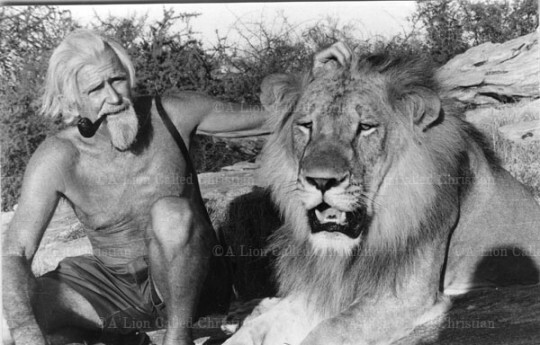 George Adamson continued rehabilitating more lions at Kora documenting and observing their lives and cubs until his death in 1989. This may prove invaluable information as there are now 70% less lions in Africa since Christian’s time. George’s assistant, Tony Fitzjohn, is now the Field Director for the George Adamson Wildlife Preservation Trust and is continuing George’s pioneering work, including the rebuilding of the Kora camp, and working with and assisting the nearest villages. Christian was Tony’s first introduction to a lion, and he has recently published his own book about his experiences, Born Wild. Christian’s extraordinary story is a symbol of human-animal relationships, and serves to illustrate the importance, interrelationship and urgency of animal and wildlife conservation. In 2009 Ace and John revised and updated A Lion Called Christian, first published in 1971 and which now includes their return visits in 1971 and 1972.